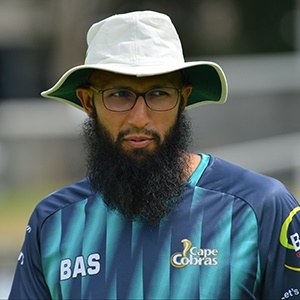 Cape Town - Rightly or wrongly, Hashim Amla's place in the Proteas' 2019 World Cup squad is not set in stone. The man has achieved almost everything and will go down as one of South Africa's greats regardless of what happens from here, but he is yet to receive unequivocal backing from the Proteas leadership when issues of World Cup selection arise. Faf du Plessis has always said, for example, that if fit, Dale Steyn will go to the World Cup. The skipper has always been certain of that fact, and it speaks directly to how highly he rates Steyn. Amla, though, has never received that same level of unwavering public support. Just two weeks ago, Proteas coach Ottis Gibson said that Amla was "definitely still in the plans", but he acknowledged that a final decision would be made once Amla's personal circumstances had been resolved. CSA selection convenor Linda Zondi, meanwhile, has also been open on just how tough a selection this was proving to be, saying it was giving him "sleepless nights". Amla has been by the side of his critically ill father since the beginning of March. He has not played any cricket in that time. In his absence, Aiden Markram has smashed the door down to all but guarantee his place in England while Reeza Hendricks has scored runs at opportune times to keep himself very much in the race. The feeling is that only two of those three top-order batsmen will go to the World Cup. Now, with exactly two weeks to go before the Proteas name their 15-man squad, Amla is back. The CSA T20 Challenge is not going to be the most exciting cricketing product the world has ever seen, but it will be well worth following if only to see how Amla gets on. The 36-year-old has been back in the nets in Durban this week, and he will be flying down to Cape Town to meet up with the Cape Cobras ahead of their clash against the Highveld Lions in Johannesburg on Sunday. Cobras coach Ashwell Prince addressed media at Newlands on Thursday, and it wasn't long before he was asked about Amla. Interestingly, Prince revealed that the CSA leadership would have preferred Amla to make his return in England during a short county stint that would have allowed him to play 50-over cricket. But while Amla's personal situation has improved somewhat, he would like to be close to home should anything change. "He is available," Prince confirmed. "My understanding is that CSA would have preferred for him to be playing in the UK, but he wanted to be closer to home." CSA have been mum on Amla's World Cup prospects, and if they are indeed undecided then five domestic T20 matches (that is what the Cobras have before the April 18 squad announcement) will hardly be the evidence the selectors need to make a sober assessment. Prince, though, believes that Amla might can use the tournament to find some touch. "I don't think extending an innings has ever been a problem for Hashim. It's about getting in. In the Mzansi Super League, he didn't manage that, which can happen after a long lay-off," he said. "I still think there is a place for somebody to bat through the innings, and he is well capable of doing that. If he bats through the innings at a 120/130 strike rate, it allows other more natural ball strikers to play their game around him. "There is an opportunity for Hashim to bat through the innings and if he does that half the time then I think he is getting enough batting." For most critics, this appears to be the only outstanding selection conundrum left for Du Plessis, Gibson and Zondi to ponder. It is Amla v Markram v Hendricks fighting it out for two World Cup places. Once those battle lines had been drawn, Markram batted like a man possessed and punched his ticket. Now, it is Amla's turn.